Blog? Blogger? What the hell its? At the beginning of Kang Bahtiar invite discussion on the blog, frankly I do not connect at all. But when given the example that early generation of Yahoo! blog started 3600, then unknowingly I have had since the first blog to the internet in the late 2000s. Yahoo! does feature 3600 is still very limited, even when it was introduced as a medium for showing our personal profile online only, nothing less and nothing more. After discussion it was then I began to recognize a free blog services such as blog.com, blogspot.com, wordpress.com, and several others. Saw lots of piles of books in a dorm room Ndalem Kebun Kacang, Bahtiar Kang believes that good enough a lot of science or knowledge they already had me read. What a pity if that knowledge then just settles in the brain’s memory without others also enjoy their emergence. He encouraged me to write down some notes from the various books I’ve ever read as merely sharing with others in cyberspace. So then I introduced annasagung.blog.com personal blog. Since having attributes as a blogger, It added my acquaintances, friends and companions through cyberspace which then progressed to many real-world events through kopdaran. Kopdar (live or current meeting) with senior first bloggers I follow the invitation Kang Bahtiar around the Sarinah. On that occasion I got to know Ndoro Kakung, Kang Zumuk Ora Kringeten, Mas Hedi, Gita, Mbakyu broker Ayu, and some friends who do not even remember anymore. The spirit and the spirit of blogging is really adrenaline, as much to bring these new experiences were very memorable. Emerged a triumvirate between myself, Kang Bahtiar, and Ipul Bangsari. The last three series grew with the arrival of Rohibun who also seek his fortune in Jakarta by joining kos Garden Beans. 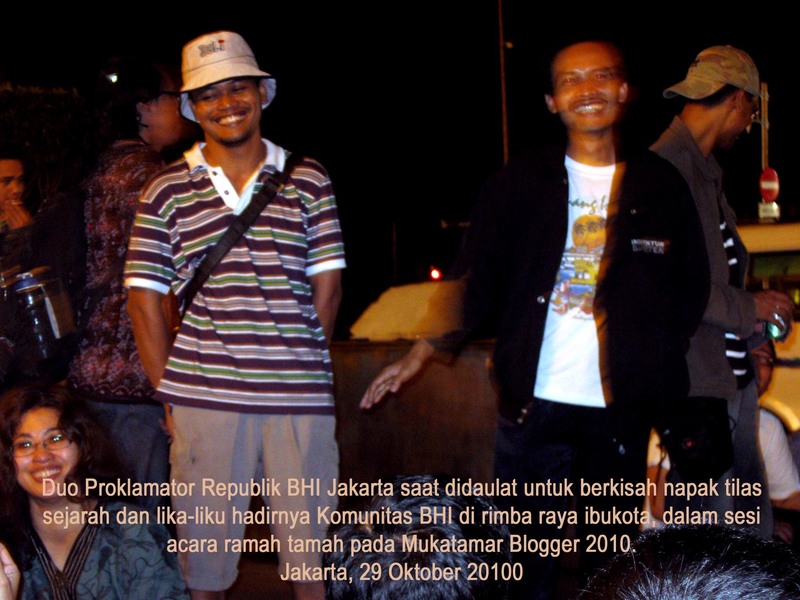 Among the four bloggers, only I was the one who did not join his company Virtual Pak Nukman. Since it’s becoming known Headquarters Garden Beans II 70 in blogger universe that invites many bloggers curiosity in Jakarta around 2006-ness of it. There was even a blogger who typically conduct such an investigation to uncover whether our sacred headquarters. With a budget of maps in hand, he walked down the Tanah Abang, in and out of some of the gang before finally finding our place. Initially it was thought that “our camp” kind of an organization or community secretariat official. But the arrival of the bloggers mentioned scouts first time, we have brought together for one reason or another. On the occasion of the second time, then he met with us. He is then the more we know as the Ducks were later crowned as BHI meeting coordinator . Since the arrival of ducks, several other bloggers often came visited us. On a night that sacred week, several bloggers are invited to come just a walk enjoying the “dancing fountains” on the south side of Monument Park. Meeting without sleeping in the long night even while chat, Japanese grass green repose continued until the early hours. Monas (Indonesian National Monument) on Sunday night was crowded with ordinary people who thirst for cheap entertainment. But there are some things that make us uncomfortable. At the grass cushion us, marched hundreds of red ants that had crawled our legs, even bite that leaves skin feeling itchy. In addition, the presence of a horse-drawn carriage at Monas leaving a scent “gempol”, or horse dung and urine, urine that interfere with our noses. Plus consideration Monas park entrance is too far from the highway, eventually to provide the opportunity for friends blogger who wants kopdar (life meeting), we decided to move around the busy life meeting at HI roundabout, right in front of Plaza Indonesia. 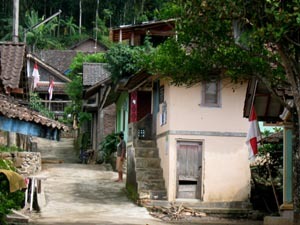 From there then appeared a phenomenal community with all its villages style known as the Republic of BHI. My move to London to sit to the god Ganesha, it actually gives the opportunity for more frequent home to Magelang. Contact through chat on the blog, I had introduced Ikhsan Kang, Kang Ciwir, Hanafi and Mas Mas Eko. Along with Chinese New Year holiday 2009 Meet me Ikhsan Kang and Kang Ciwir, and si Ponang in Ndalem Peniten. Note I wrote the first meeting with the title Kopdar Tidar Swordsman. Phrases that inspired Swordsman Tidar Kang Ciwir make banner Tidar Swordsman: Magelang Blogger Community . Since that’s the name of this community of bloggers in Magelang our clothing. 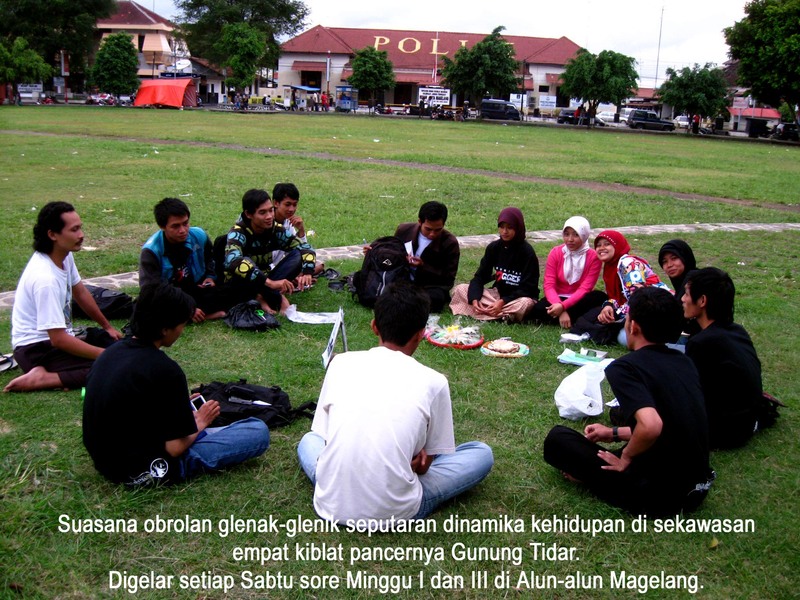 In connection with the implementation of Magelang anniversary in early April 2009 in Magelang Square, it’s gathered about 15 bloggers that have relevance to Bhumi Tidar (the land of Tidar). The essence of the conversation was the first of the new community support program declared for books for the library collection in the village that has been initiated by Ngampon PATTIRO, PMII, and the local village youth. We, especially me personally, of course, very aware of how stunted and small communities and reveal our ideas together. As a community that nobody in public life chessboard Magelang or Kedu Residence, of course, not a lot of action or agenda that we done. However, with all the limitations of resources, especially its personnel and funds, at least we are committed to introduce Magelang to the global by blog via the internet in accordance with the vision and mission of our community. Our intention is play a role in globalizing and popularizing the potential possessed Magelang to stage the world socially. 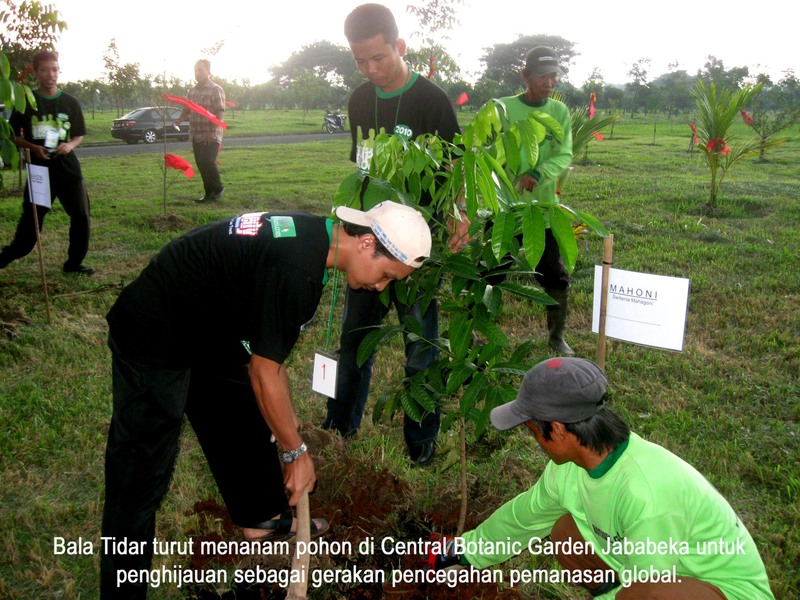 To realize the goals, vision, mission and our commitment to Magelang, we also often join in the blogger community agenda in other areas in order to further expand the association and of course in order to claim that there Magelang, not only on the sheet of the map only, but comes clearly through the virtual world and the real world. Especially to contribute to a vehicle for the development of student creativity in Magelang, we regularly hold community writing competition among junior-high school students and seminars for teachers in every community momentum birthday. Regular agenda has been going on for three consecutive years from 2010, 2011, and 2012. In the case to spread blogging virus, we also assist several schools or community groups to learn blogging by free. This gait us to “fly” Magelang, land of birth and our ancestors.